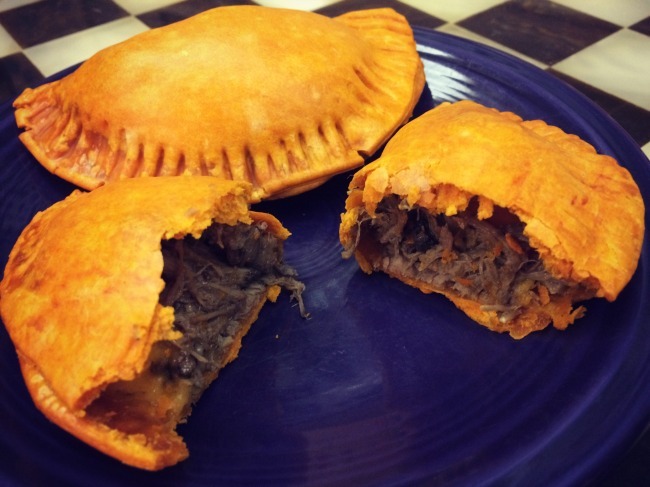 Recently we discovered a new easy dinner dish in the form of a Baked Short Rib Empanada. The obsession with the Short Rib Empanada began one evening with leftovers from my Slow Cooker Short Rib Poutine. 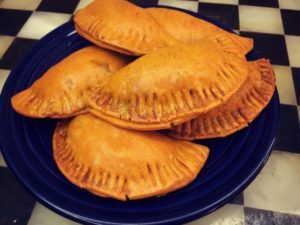 Ella had recently made some sweet Guava Paste Empanadas for her Spanish class and they were delicious and got me thinking about meat filled empanadas recipes. One evening we did not have any plans for dinner, and I wanted to clean out the fridge, so I created a Short Rib Empanada that was delicious and pretty quick and easy to put together! It was an instant hit with the family, and I made plenty so we could have leftovers for lunch during the week. These were great as a main dish, but they would also make for a filling appetizer at a party! 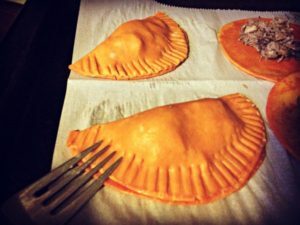 I cannot wait to create even more Empanada Recipes!. 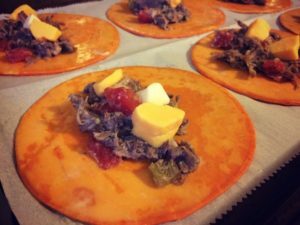 Mix together Rotel and Shredded Short Rib. 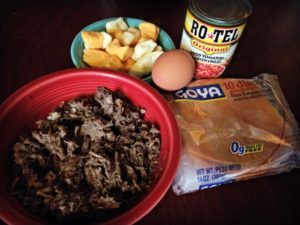 Place 2 Tablespoons of the meat mixture into the center of the Empanadas. Cut up the curds into small chunks and place cheese on top of the meat mixture on the empanada, taking care to spread them out. I put three pieces of cheese on my empanadas and that seemed just right for us, but you could add more if you want to make your short rib empanadas cheesier! Beat the Egg white and mix in a tablespoon of water. Then brush the outside edges of the empanadas with the egg. Fold the empanda over and press the edges together with your fingers, but then go around the edge with a fork as well to really make sure they are sealed. Put the empanadas on the cookie sheet and brush a little bit of the egg mixture on the top of each. Turn the oven on to 375° and let the empanadas sit on the cookie sheet while the oven heats up. Bake for about 20 minutes, until the Empanadas are golden, let them cool for a few minutes and then serve warm. **I used leftover Short Rib Meat from our Slow Cooker Poutine dinner a few days before -YUM!